We often hear stories of patients complaining of ‘severe’ back pain which when examined under MRI scan reveals very little, if anything, that may suggest a cause of pain. At this point it is often suggested that the back pain is more of a psychological issue than a mechanical problem: “It’s all in your mind!”. Last weekend at the Back Pain Show I was talking to one of the Upright MRI providers – Medserena who are opening in London. In the past, one of the selling points of the upright MRI scanner was that it is more comfortable for patients compared to traditional MRI scanners where the patient has to lie down and enter a very narrow tunnel. For some people, the “lie-down” scanners were simply too claustrophobic, hence the appeal of an open / upright MRI scan. Upright MRI scans are more expensive than “lie down” scanners since the equipment is quite different (much bigger and more costly). This can deter both self-pay patients and insurance companies from paying for upright scans. 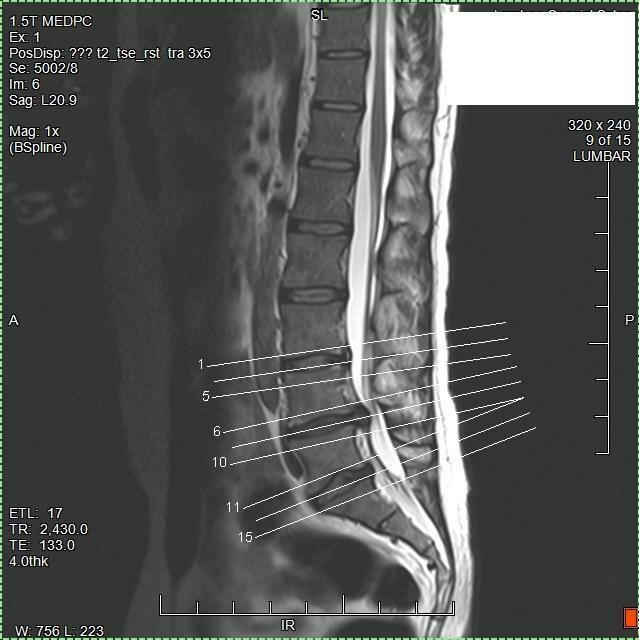 Of course the clinical benefit of the upright MRI scan for low back pain is not so much the comfort, but the ability to see what happens to vertebral structures when they are under load ie when the patient is erect and load bearing (standing up) or sitting upright, rather than supine and non-load bearing (lying down). 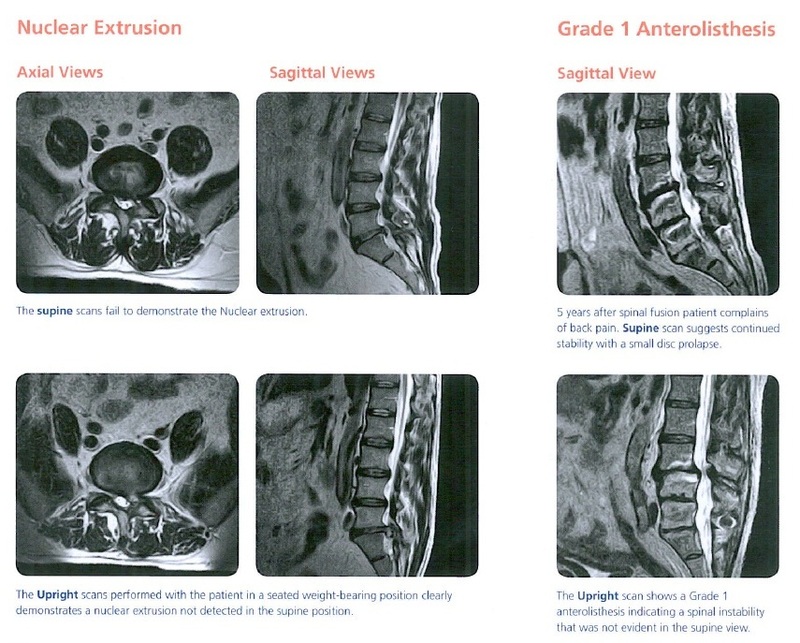 As can be seen, there are important differences in pathology which are only revealed when the scan is carried out with the patient upright with the spine under load. There are only a handful of upright MRI scanners in the UK and this raises some new questions in my mind about the role of MRI scans and implications for treatment schools of thought. What the above comparisons and others like them show is that it is possible for the load bearing effect on spinal pathology to go undetected with Supine MRI scanning in some cases. When a spinal pathology is detected with an Upright MRI scan, there may be times when alternative treatment plans with an emphasis on functional restoration may be more appropriate. Images courtesy of Medserena Upright MRI Ltd. The latest UK IDD Therapy treatment location is the SPINEX Clinic in London Docklands. In this short video, Clinic Director and highly experienced osteopath Sally Lansdale shares her own back pain journey and how it was only when she tried IDD Therapy, that she was able to be free of back pain and enjoy her work. Located near to Canary Wharf (1 minute from South Quay Station). This article considers the role of the MRI scan when treating low back pain with IDD Therapy. It raises the possibility that early back pain studies conducted without MRI technology were in part flawed since without consideration of the underlying condition, how would it have been possible to create and direct an appropriate treatment regimen? When back pain and neck pain remains unresolved, clinicians now use MRI scans to help diagnose or confirm the cause of someone’s pain. As an example, IDD Therapy treatment providers take advantage of MRI scan technology for three reasons. IDD Therapy treatment uses a computer-controlled, cyclic pulling force to distract and mobilise targeted spinal segments in an axial plane. The application of distraction forces is safe, however it is essential to ensure there are no contraindications, such as a vertebral fracture or metastasis (cancer). (A full list is available by contacting Steadfast). The scan helps to confirm whether IDD Therapy may be appropriate and the most common conditions treated include herniated discs and degenerative disc disease. The MRI scan helps the clinician to select the level to be treated e.g L5S1 disc and to understand the severity of the condition. IDD Therapy treatment protocols detail a set of angles which when applied, enable clinicians to distract targeted spinal segments. Shealy & Bourmeyer 1997(1) first observed that applying distraction forces at different angles enabled them to open the disc space 5mm-7mm. Whilst dermatomes and clinical diagnosis help clinicians, without an MRI scan to confirm the diagnosis, it is very difficult for the clinician to be clear in the treatment plan. Common use of MRI scan technology developed long after use of traction was dismissed. Whilst traditional traction was never applied scientifically with measured angles, with sufficient force for sufficient time, significantly, traditional traction treatment was never applied with the knowledge of which level and what pathology was being treated. If you are not aiming, how can you achieve your goal? It would be like blindfolding an archer and pointing them in the general direction of the target. So, with IDD Therapy it is, where possible, desirable to have an MRI to determine the condition being treated and then using the SPINA machine tool, to direct treatment to the targeted level. Of course, if treatment is not responding adjustments can then be made. Having spoken to hundreds of clinicians who used traditional traction, I am yet to meet a single one who used any kind of precise methodology in the application of the treatment (irrespective of the tool they were using). Invariably it was, “we’d try a bit of traction and see what happened.” Since they would not know the nature of the condition they were treating, how could they apply a method other than pull and hope? This quite frankly is useless and we can ask it is any wonder that outcomes in clinics were so poor?! The other benefit of the scan is to be able to see the size of a disc herniation or the degree of degeneration. It is extremely difficult to structure a randomised controlled trial with a one-size fits all approach for back pain. IDD Therapy has a growing body of evidence to support it and more will be needed to help develop and refine treatment programmes. Anecdotally, clinicians will confirm that larger disc herniations require more time for treatment than small bulges, whilst degenerative discs tend to require more treatments before improvements can be felt. The use of the MRI scan is thus a key tool to enable clinicians to target and treat chronic low back pain more effectively. For a summary of the differences between IDD Therapy Spinal Decompression and traditional traction, please use the form below. (1) Shealy CN and Borgmeyer V. Decompression, Reduction, and Stabilization of the Lumbar Spine: A Cost-Effective Treatment for Lumbosacral Pain. American Journal of Pain Management. 1997. 7:63-65.